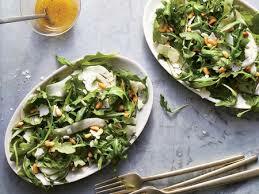 Peppery arugula combines with tangy lemon, salty cheese, and sweet toasted pine nuts for a perfectly balanced side salad. Slowly drizzling the olive oil into the lemon juice mixture helps emulsify the dressing. If you add the oil all at once, it’s harder to combine it with the acid, and it ends up looking like the dressing is separated. Serve this salad with grilled chicken or seared steak or top with lemony tuna salad. Combine lemon zest,lemon juice, honey, kosher salt, and black pepper in a small bowl. Slowly drizzle in olive oil, whisking constantly, until emulsified. Combine baby arugula and shaved fennel in a large bowl. Toss with dressing, and top with pecorino Romano cheese and toasted pine nuts.